Tennessee Prompters has 17” High Bright LCD monitors on adjustable stands, capable of rising the bottom of each monitor up to nine feet off the floor. These monitor-stand combos can be used for over-the-shoulder teleprompter reads, mock interviews, as confidence monitors or as playback monitors. Sand bags are included as needed. 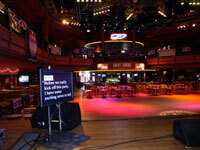 Tennessee Prompters has a large number of 15” LCD and 17” High Bright LCD floor and stage monitors. Our stands are flat black, low profile and allow each monitor to be set to an infinite number of angles. You can place our floor monitorsacross the front of your stage, put a monitor near the piano or near background singers, or built into your meeting’s mock living room set, etc. Every year, the Country Music Association hosts "Fan Fair," a week long celebration which draws thousands of country music fans to Nashville to meet and hear their favorite country music stars. Each year, NBC Daytime hosts "NBC's After Hours Party" at the Wildhorse Saloon, featuring actors from NBC's daytime Soap Opera shows. This photograph shows one of two, 42" LCD Plasma Monitors with custom stands used by NBC for presentations to their live, and often rowdy, audience. Stage monitors can be made mobile. For the Harry Conick, Jr., Christmas concert, held in Nashville’s historic Ryman Auditorium, a 27” video monitor was placed on the rolling half of a road case. The monitor was used by Harry’s special guest, George Jones, and then rolled out of the way after use. Some situations call for teleprompter monitors to be off axis from the camera, as with Oglesby Video Post’s shoot for Sanofi Synthelabo in Evansville, Indiana. Here, two 14” monitors are positioned so that both actors can read their lines without looking directly at the camera. Jumbo Bright Ultra Bright displays are bigger and ten times brighter than traditional video monitors, making mid to rear of the room teleprompter displays a practical option. Due to the patented technology built into every Jumbo Bright display,anyone sitting off-axis to the projected image won’t be able to read the scrolling text, including video cameras. The optimal viewing range for a Jumbo Bright 70” display is 60 to 120 feet and each 70” display comes with its own stand (or can be flown from the ceiling.) Plus, all Jumbo Bright displays function wonderfully outdoors, even on hot days in bright sunlight. Off camera monitors can also be used inside/outside to simulate live interviews. 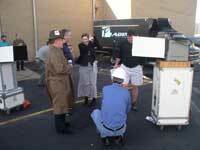 For Sanofi Synethelabo, Oglesby Video Post boxed sun screens around two 14” monitors for outdoor use. Jumbo Bright Ultra Bright displays are bigger and ten times brighter than traditional video monitors, making mid to rear of the room teleprompter displays a practical option. Due to the patented technology built into every Jumbo Bright display, anyone sitting off-axis to the projected image won’t be able to read the scrolling text, including video cameras. The optimal viewing range for a Jumbo Bright 105” display is 90 to 180 feet and each 105” display comes with its own stand (or can be flown from the ceiling.) Plus, all Jumbo Bright displays function wonderfully outdoors, even on hot days in bright sunlight.